On returning to Singapore after a month overseas I found Gaggan fever had taken over. It was all everyone seemed to be talking about. What was going on in Asia? The brainchild of chef Gaggan Anand had catapulted to number 1 on San Pellegrino’s Asia’s 50 Best Restaurants this year, hosted in Singapore. As one can only expect, the crowds were pouring in, including royalty, international celebrities and gourmands from the world over, making this the new ‘it’ restaurant in Asia. How could I be left behind! I went right to Bangkok and didn’t return till I had myself a meal at Gaggan. “We had 5000 reservation requests the day we got listed in the top 50 list. Our website crashed!” admits Gaggan Anand. And yes, I was fortunate to have a chat with him during my meal. Chef Gaggan attempts to bring to his cult following some of India’s most famous street foods without actually eating on the street. The menus are seasonal. 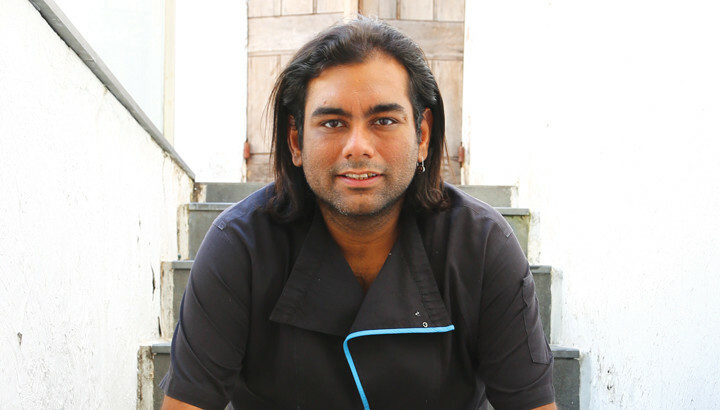 Many call his food molecular Indian cuisine, Gaggan prefers the term “Progressive Indian”. Prior to opening, Gaggan spent two months training with the research team in Spain at famed Ferran Adria’s three Michelin-starred El Bulli and learnt the deconstructive approach to cooking from the master himself. “ I am the first Indian to train under Adria,” smiles Gaggan. Needless to say, foam, smoke, gels, syringes, pacojets and liquid nitrogen; techniques like spherification, freeze drying, smoking, gelification are all used in chef Gaggan’s kitchen like ladles are used in ours. A quick tip – if you are lucky enough to get a reservation there is no better spot then the chef’s table adjoining the kitchen. The best place to view where all the magic happens. The God’s were kind the day I visited. That is exactly where I sat. In my opinion, the tasting menu “Best of Gaggan” is a combination of 16 of the chef’s most stunning dishes and perhaps the best way to sample his genius. Each dish I tried was nothing short of stellar, in terms of both taste and presentation. Viagra featured freshly shucked oysters topped with Yuzu chutney and lemon air. Served with a pair of pliers, the dish was an absolute treat for the palette and the eyes. 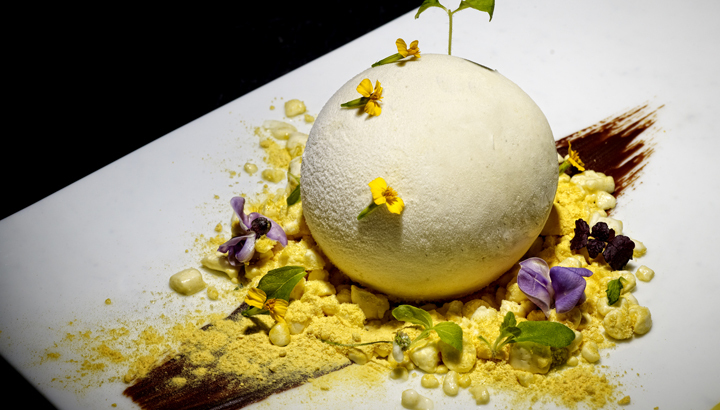 Alchemist’s Cake, better known to Indians as dhokla, is topped with coconut ice cream, curry leaves and mustard. Sheer brilliance. Street eats from India showcased chef Gaggan’s take on papdi-chaat with a delicate sphere of spiced yogurt containing an air bubble which literally burst in my mouth. His version of pani puri was a white chocolate ball filled with spicy coriander water and sealed with edible silver paper. The highlight of this concoction was an edible ‘plastic’ bag (made of rice paper) filled with wasabi nuts. After a slew of desserts, the grand finale “I Love Chocolate” was prepared at our table on a piece of cold marble. Five different types of chocolate in diffrerent textures and tastes are plated, leaving a phenomenal cracking sensation in the mouth. Culinary innovation at its very best. “We have seven nationalities – Spanish, Dutch, Venezuelan, Indian, Indonesian, Thai and Japanese – in the kitchen preparing Progressive Indian cuisine,” chuckles Gaggan. While you are reading, this Kolkata boy is changing the way Indian food is perceived. Indian cuisine that is centuries old is ready for an interesting new twist and chef Gaggan is at the helm. As we went to publish this article the San Pellegrino World’s Best awards were just concluded in London after Asia’s 50 Best was hosted right here in Singapore. We are delighted that three of Singapore’s finest establishments feature on this list with Restaurant Andre coming in at No. 46, Waku Ghin at No. 70 and JAAN at No. 74. Well done Singapore! You can do a short trip to Bangkok and visit Gaggan or stay right here and sample some of the very best Singapore has to offer the world.